This "Starry Night Over the Rhone - Van Gogh" tapestry shows the work of van Gogh originally created in 1888. This work shows the Rhone river in Arles where the cityscape lights can be seen in the background. The same location was also the source of inspiration for van Gogh's production of Starry Night as well as Cafe Terrace At Night. These gorgeous nocturnal works shows the way van Gogh plays with the themes of impressionism and the imagination. The rendition of stars and the reflection on the water gives these elements a life of their own. In a letter to his brother Theo, he described his impression of the view as a "russet gold descending down to green-bronze". 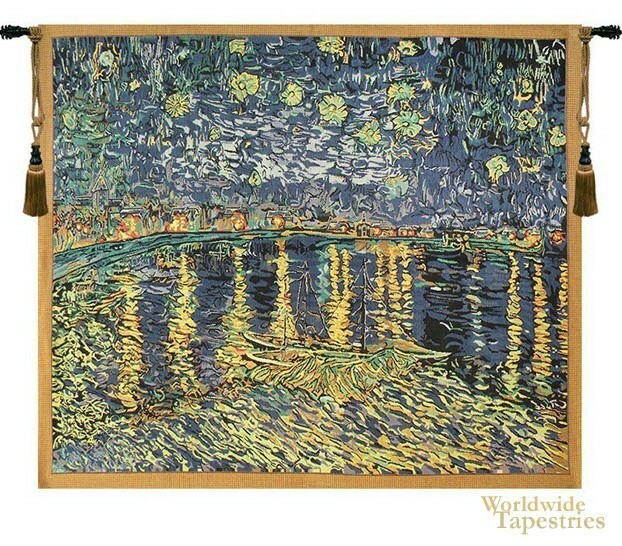 This fine art tapestry "Starry Night Over the Rhone - Van Gogh" is backed with a lining and has a tunnel for easy hanging. Note: tapestry rod and tassels, where pictured, are purchased separately.